Anyone who knows lifelong Port Jervis resident Katie Onofry Sandberg knows that her upbeat personality does not let much get her down. Despite a life-threatening illness that she was diagnosed with as a teen, the cheerful young wife and mother says she loves life and is always aware that there are others who have it much worse. She is grateful for the support of her family, friends and community as she continues a strenuous course of treatment to fight the disease. A benefit dinner attended by more than 200 was held recently at the Erie Trackside Manor to assist the Sandberg family with mounting expenses and to show support as Sandberg’s treatment continues. Sandberg has Cushing’s disease, caused by a tumor on her pituitary gland, which releases too much adrenocorticotropic hormone throughout her body. Sandberg said a biopsy taken during an eight-hour surgery in 1999 failed to find the tumor and caused her symptoms to spiral out of control. Extensive research and persistence on the part of her mother, Sue Onofry, led her to Massachusetts General Hospital. It was there that the disease was diagnosed in June 2001, the same month that then 18-year old Sandberg graduated from Port Jervis High School. After successful transsphenoidal surgery a few months later, the tumor was removed and Sandberg was placed on steroids for adrenal balance. “Seven years later, in 2008, I got off the steroids and was considered cured for the time being,” Sandberg said. Over the next years, Sandberg earned an associate’s degree in business administration from SUNY Orange and CDA certificate from Keystone College, completed schooling in graphic design from the Art Institute online, worked in early childhood education and in public relations, owned Kate’s Cafe in downtown Port Jervis, married, and became a mom. Over the past year, Sandberg’s symptoms returned. Cortisol tests came back in the 600s — a normal range is 18-50. In February, she underwent a second transsphenoidal surgery, which this time was unsuccessful. She was then placed on medicines to help regulate her cortisol levels. She will complete a six-week proton radiation treatment May 23. Having the young mom in Boston for so many weeks of treatment has been tough on the family. She said she greatly appreciates daily contact from her friends and family members, and is grateful that her daughter is being cared for by her husband, parents and in-laws. For more information on Cushing’s disease, Katie Onofry Sandberg recommends the Cushing’s Research Foundation and she would be glad to answer questions herself at Kosandberg@gmail.com. She hopes that by sharing her story, she might bring awareness and possibly help for someone else. Sadly, we lost another Cushing’s patient on Friday, May 9, 2014. Melinda was a member of the Cushing’s Help message boards since Jun 24, 2007. She was only 25 and leaves behind a young son and many loving family members. I’m not really sure where to put this post so I’ll just put it here under miscellaneous. Last Friday was probably the closest I’ve ever come to actually dying. Luckily, my dad came downstairs to check on me. At some point Friday I completely blacked out and my dad found me totally unresponsive, barely breathing with foam in my mouth. The paramedics told my dad that if he hadn’t found me when he did I would of definitely died. Nobody knows what caused this to happen. The hospital is trying to say that I overdosed on drugs, which is TOTALLY 100% untrue. Especially, since I hadn’t even taken my medicine because I was staying up with my mom to help her clean and move my stuff upstairs from the basement. By the time the ambulance got me to the hospital I was still unresponsive and my kidneys had shut down. I don’t remember anything from Friday or really much from Thursday night. All I remember is waking up in the ICU at the hospital in the middle of the night with some grumpy nurses who kept asking me why I tried to kill myself. I just don’t understand where they got the idea that I was trying to commit suicide, all of my medication was accounted for plus some. Another thing, now I’m on oxygen 24/7. Since Friday I have a hard time breathing so the hospital sent me home with an oxygen tank. I feel so old. I’m only 24 and I don’t even smoke yet I’m stuck with an oxygen tank. Something just isn’t right. We talked with my regular doctor and she thinks that I might of had a stroke or maybe a seizure. I go see her on Wednesday. But until then I can’t do anything and have to be supervised at all times. It’s really strange, I’m being treated like a baby but I feel like I’m 80. I just want to be a normal 24 year old and feel like my age. Melinda “Mindy” Smith, age 25, of Harrison, passed away suddenly on Friday, May 9, at her home. Mindy had attended Farwell High School where she had been an honor student and participated in track and cheerleading. She graduated from Clare High School in 2005. She was currently attending college and was hoping to pursue a career as a Psychiatrist. Mindy talked often of becoming a doctor to help others who were struggling with Cushing’s Disease. 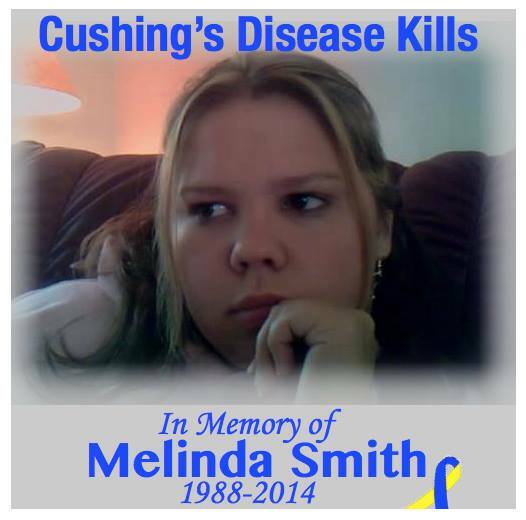 Mindy had been battling a fight with Cushing’s Disease since 2005. She fought hard and long, but unfortunately it was a fight that she could not win. She was loved by many, but will be missed by many more. Mindy is survived by her son, Landon Smith, parents, Deb (Marc) Davis, Fred (Nola) Riggs, of Harrison, and Ralph Rydman, her special friend, Ryan Smith, siblings, Alisha Green of Farwell, Marrissa Rydman of Gresham, Oregon, Misty Riggs of Weidman and Mike Riggs and Seth Riggs both of Florida, her grandparents, Gary (Penny) Smith of Clare, Sheryl (Phil) Wentworth of Harrison, Janet Riggs of Harrison, and Jay Davis of Clare. Also surviving are many aunts, uncles, and cousins that will miss her dearly. She was preceded in death by her grandparents, Dawn Wiggins of Muskegon, Harold Riggs of Harrison, and Carol Davis of Clare. Funeral services will be held on Wednesday, May 14, at 2:00 PM at the Clare Chapel of Stephenson-Wyman Funeral Home with pastor John Kasper officiating. Friends may meet with her family at the funeral home on Wednesday from 11 AM until the time of services. Memorials may be directed to the family. Kathy was diagnosed with a pituitary tumor in 1991. At the time the only symptom she was aware of was a severe headache. She had a transsphenoidal resection followed by radiation therapy for 23 days. They said they could not remove all of the tumor. She is now on Signifor and Cabergoline. Listen to Kathy’s Interview here. Hi Ladies and Gents, my fellow Cushies! I am a currently mid 20s student living in Toronto, ON, CAN, with big dreams and a big heart. I have been part of this network for a while now and although I’m not always active on the site, I am always eager to spread the word, the love, the support for any of you!!! Just contact me, anytime! As for myself, I began gaining weight and not being able to control it when I was in my late teens/early 20s. Ironically, my family MD at the time AND the one after that said that was a ridiculous idea and it couldn’t be that and simply DID NOT TEST ME. Luckily, in 2009 when I moved to Toronto for my new degree, I met with a new Doctor who is an admitted “over tester”, however she did help steer me to my Endocrinologist for the diagnosis. It took nearly 2 years of testing, Dex-suppression tests, IPSS, vials of blood gone, MRI’s, CT’s, and too many jugs of 24-hour urine tests we had it narrowed to a pituitary cause but could not locate it on imagine or by approximate location (right, left, etc). So the wait began as I was referred to my neurosurgeon and the Pituitary Clinic and their hospital until the day came and I went under!